This year’s honorees include (left to right) Olivia Dear, Christopher Feazell, Dillon Hall, Alexis Smith and Loden Snell. OXFORD, Miss. – The University of Mississippi chapter of Omicron Delta Kappa Honor Society has honored six students for their academic performance, leadership and community involvement. 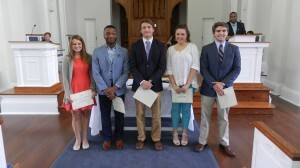 This year’s recipients of ODK Freshman Leader Awards are Olivia Dear of Madison, Seth Dickinson of Mantachie, Christopher Feazell of Mendenhall, Dillon Hall of Saltillo, Alexis Smith of Picayune and Loden Snell of Ridgeland. Dear, a graduate of Madison Central High School, is president of ASB Freshman Council and serves on the Chi Omega sorority philanthropy committee. A member of Lambda Sigma honor society, she is a Provost Scholar and on the Chancellor’s Honor Roll. An English and journalism major, she volunteers with Leap Frog, Hermitage Gardens and the Oxford Humane Society. Dickinson attended Mendenhall High School. He is a member of the Sally McDonnell Barksdale Honors College and Trent Lott Leadership Institute and is an Honors College Freshman Senator. A public policy leadership major, he is a recipient of a Lott Scholarship and is an Ole Miss Ambassador, member of Delta Psi fraternity and on the Dean’s Honor Roll. He volunteers with Brookdale Oxford retirement community. Feazell, an accountancy major, attended Mendenhall High School. He is a member of the Sally McDonnell Barksdale Honors College, Luckyday Success Program, National Association of Black Accountants, Undergraduate Black Law Students Association and Lambda Sigma honors society. He is a LuckyDay Scholar, on the Chancellor’s Honor Roll, a Rebel Quest counselor and a volunteer tutor for business calculus. 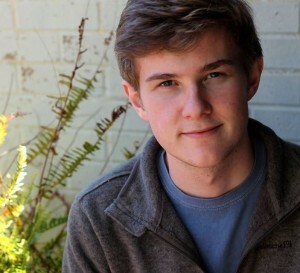 A graduate of Saltillo High School, Hall is a member of the Sally McDonnell Barksdale Honors College, Center for Manufacturing Excellence, Engineering Student Body Leadership Council, Engineers Without Borders Design Committee, American Society of Mechanical Engineers and Delta Psi fraternity. A mechanical engineering major, he is a CME ambassador and a volunteer with Green Grove Initiative and Oxford City Market. Smith, a graduate of Picayune Memorial High School, is a member of the Sally McDonnell Barksdale Honors College and the Croft Institute for International Studies, and is an Honors College Freshman Senator and community service co-chair for International Justice Mission. She is a recipient of an Honors College scholarship and a member of the Chi Omega scholarship committee. An international studies major, she is a writer for the Daily Mississippian and a volunteer with Oxford Humane Society and More than a Meal. A graduate of Saint Joseph Catholic School, Snell is a public policy leadership major in the Trent Lott Leadership Institute and recipient of a Lott Scholarship. He is also a member of ASB Freshman Council, Residence Hall Association, College Republicans and the Chancellor’s Leadership Class, an ASB senator and Stockard Hall Council President. He volunteers with the Big Event and Green Grove Recycling. Omicron Delta Kappa is a 100-year old leadership honor society that has initiated more than 300,000 members at since its founding. The society has more than 285 active chapters at colleges and universities across the United States.